How is it possible to want something so bad and yet I find I'm constantly pushing any possibility of having it away? I can have it all and yet I'm blatantly pushing it all away. There must be something wrong with me. But I do want it. I think. I just don't make any sense. I've literally spent some long moments off in space just trying to figure myself out. Like, having conversations with my alter ego's in my head, going back and forth trying to figure out why the heck I am so ridiculous all the time and I literally can't come up with anything. Nothing. So I just leave it at the fact that I'm just weird complicated and want what I can't have and don't want what I can? Eeeeeeebiejeebies. There are so many times where if I described myself in one sentence, right now, I don't like what I hear. Sometimes I think I'm becoming I used to look down upon. I'm a good person in a lot of ways, also, I know that. Who knows. I try to be a good person. I just don't even know what I want right now. So I might as well write about this one! First of all, thanksgiving has always been my favorite holiday. For me it's always been a holiday spent with family from afar, and obviously lots of good food. The family I'm with every year from childhood is everything I could ask for. From just a child I've transformed in this big family from sitting at the kids table with them to progressing to the adult table. Now as an equal, or at least seen as more of an equal adult nowadays, I've learned a lot about what true family Is, what it means, and how thankful we are for family. For me, thanksgiving is about family. - first and foremost, being 99% healthier than I ever have been. So these past couple nights I had a pretty interesting round of patients. My one though, was probably my first patient who scared me. She has chronic COPD and emphysema. Now, we learned about these two evils in class...In clinincals and as an RN I've had patients with "a history" of COPD/EMP and occaisonally they ask for an inhaler...And I guess in my mind thats all I thought it was. I guess I knew it got worse but so far I had never encountered it. Until last night. She was extremely nice. Elderly woman. But the simple act of going to the commode which was right next to the bedside, was the equivalent of you or me running two miles with no break. Audible wheezing, gasping for air. On top of all this, she was admitted with extreme back pain and was going for surgery the next day, which was giving her extreme anxiety on top of it all. So, luckily she slept through the night for me. I checked on her every hour (theres that hourly rounding for ya) and was thankful to see her breathing normally with no problems and she didnt appear to be in any pain. But then comes time to wake up. First what happened was she needed to take her pills, but I had to have her sit up so she wouldn't choke. So she leaned forward in the bed, and she's now the color purple, and shaking violently. However she manages to get down the pills and falls back into bed but she's in excrutiating pain. Now, ( in comparision to the twenty something I had the shift prior who was making up reasons why she needed Dilaudid), this lady was truly in 10/10 pain. This was the first time I was actually watching the clock waiting to see when the next time I could give her Dilaudid. She even told me she hates painkillers, but the pain is so severe that she needed to take them. I believed every word. So after I got her less purple and breathing a little better (just from the simple act of leaning forward in bed), she got a breathing treatment. After that, she wanted to seize the golden window to get on the commode. Nursing is the art of timing everything just so, so that maybe, if you're lucky, you can avoid emergencies and your patient ending up blue on the floor. So me and her timed it right so that she would get up to use the commode right after her breathing treatments and I would time it so that she would get her pain medicine about 30 minutes before we made the move. Even so, its always an epic adventure/risk but a needed one. I always try and time it so that I can spend *at least* 30-45 minutes with her on one of these trips to the bathroom (oh the beauty of having time on nightshift!). She told me, "you know you have a loss of dignity when you can't even have a normal trip to the bathroom and peeing all over the floor." It broke my heart, to feel for what it must be like in her shoes. For those of you that don't have asthma, COPD, or emphysema, imagine when you've had a bad cold in your life, that tight feeling you get in your chest that you just aren't breathing right. You just can't seem to take a full breath. You get short of breath faster. The simple act of brushing your teeth makes you exhausted and gasping for air. Now imagine that feeling being 10X worse. Now imagine suffering through this for 20 years, until your death. You are on your death bed, gasping for air, feeling like you are slowly drowning alive. In her case, add on 10/10 excrutiating nerve back pain and you've got yourself hell. After I got her back into bed and *somewhat* comfortable, I had some time to really sit with her and talk to her. I knew she was having extreme anxiety about the surgery and that certainly wasn't helping her breathing. So I stayed with her for an hour, sitting at her bedside, even holding her hand. I let her talk and talk because thats what she truly needed. I listened. She needed someone to listen. We all do. As my first week flying solo (meaning I have left the comfort of having a preceptor to guide my decisions), I feel extremely unconfident. As I teach my COPDer breathing exercises to calm her down, am I even doing any good? Should I be doing more? When she says, "I can't breathe", do I freak out? If it were any patient, she'd be a CAT call or possibily even a code. But this is her baseline. So I have to think around the problem. The best we can do is breathing treatments, repositioning, inhalers and breathing exercises. But with me being so new and her being so sick, I was so nervous I wasn't doing enough. I prayed that she'd just make it through my shift, just keep breathing, please. 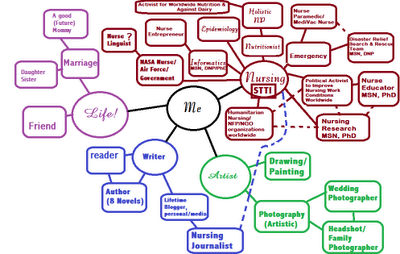 However I am beginning to really see whats important and whats not in nursing. I'm slowly beginning to see the bigger picture. Even though she is admitted for back pain, has baseline horrible COPD, a big big problem was beggining to be her bowels. On my second shift, she hadn't gone in over 6 days. I offered her prune juice and her prescribed laxatives but she kept refusing. Eventually I got it out of her that she is afraid to take any laxatives because she's afraid of having to rush to the bathroom and not being able to breathe. So I'm beginning to recognize that as almost an equally significant problem as both of her admitting diagnoses. Apparently I did a good enough job, because when I got her settled in the morning, I gave report to the day nurse and we both went in to meet her. After that I finished some charting, and by 8am I walked by one more time and stopped by to say goodbye. She confided in me and told me she was really going to miss having me as her nurse. She then began to beat around the bush and was indirectly trying to ask about the day shift nurse. Eventually I had to ask, "What is your question?" to see what she actually wanted to know, because I didn't want to give the wrong answer. She then said, "is the day nurse going to be as good as you? Is she going to.....you know, know how to take me to the bathroom like you have been?" I was........astounded. She felt that comfortable with me? Me? A three day old solo nurse? (of course she didnt know that, but still). After I got over the initial shock, I reassured her that her day nurse was one of our best and is the nurse that even trained me. That helped her anxiety some. But I was truly astounded. After three nights of literally just *praying* she would make it. Well, goodbye for now folks, thanks for reading through! Hey Everyone! Its been a pretty insane week, I just pulled through 3 twelve hour's, one night off (last night) and have three more to go starting tonight. Yay! And I just started the inevitable daunting night shift this week, as well... So, I'm tired. But anyway, my hospital is starting a new approach to patient satisfaction, hourly rounding and reducing number of call bells. As many nurses do and all nurses should be doing anyway, hourly rounding is supposedly the key to making patients and nurses happy. As nurses, we naturally are in the room almost hourly anyway, but our new approach is to make it obvious with our wording, and say "Hi, I am doing my hourly rounding, Can I get you anything? I have some time." I think this is great. It does make the patients happier and they don't feel like they are bothering you if they do ask for something, especially with the "I have some time" thrown in there at the end. At the end of our interaction at hourly rounding, we are supposed to say, "I will be back in a couple of hours to round on you again." We are not supposed to say "Call me if you need me", even if we tack it on to the above said phrase. Supposedly if we say this, it invites patients to call if they need something in the middle of the rounding cycle, and therefore there are more callbells to be answered. Whereas if we don't say it, Patients are more likely to group all their requests together and wait until we come back for rounding to have all their requests completed and questions answered. This is supposed to give nurses more time for attending to more complicated patients, emergencies, charting, etc. Now, I have been trying really really hard to adapt to these phrases our hospital wants us to use. I try to work them into my interactions with patients without sounding like an automated nurse robot. However, I cannot seem to not say "Call me if you need me." I try, i do try to not say it, but somehow to me It just feels so wrong. Although yes I see the benefits for the nurse, I feel like my patient would feel like they cannot call me, and they must wait for hourly rounds to get something from me. I want patients to feel comfortable and call me if they need anything at all. I think hourly rounding is highly beneficial as well, and I don't want to ONLY say "call me if you need me" because then that dips the patient on the other side of the spectrum and they feel like they are alone and will never see you if they don't call for something. Then they call for every tiny request because they are subconsciously checking to make sure you are even still on the floor with them, especially overnight when not as many people are walking through the halls continuously. No one wants to feel alone while in the hospital. So basically, I am happy saying to patients, "I will be checking in with you hourly throughout my shift but feel free to call me if you need anything in the meantime". It may not be fitting with my hospital policy, but it is fitting to my personal morals. I feel like the above said phrase lets patients know that I will be checking in hourly, and that they are not alone, but also gives them comfort that I am only a call button away. I have been meaning to go to This Bookstore since I first saw a brochure for it last June, I just haven't been able to make the day trip out anytime since. (I know, sad.) 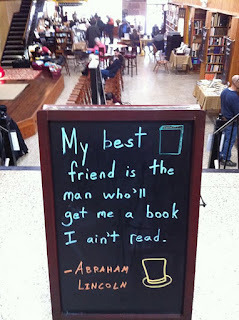 But I finally saw an advertistment for a book festival they were having and I knew it, I had to finally go. No matter what. So I did. Despite the two hour trip, it was so worth it. The city of Harrisburg was nice (sketchy in areas, but nice overall) and the bookstore was definitely something to write home about. 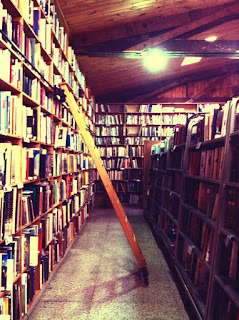 You could just tell, the minute you walk in their doors, that every soul in there loves bookstores just as much as you. Its a passion, in fact. 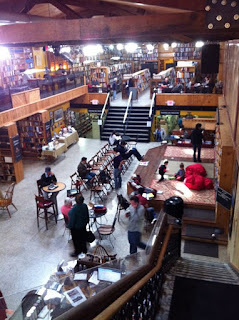 All the people in the world that go to bookstores to de-stress and just be in a happy, comfort-zone place, they are there. They are just like you...in that aspect. 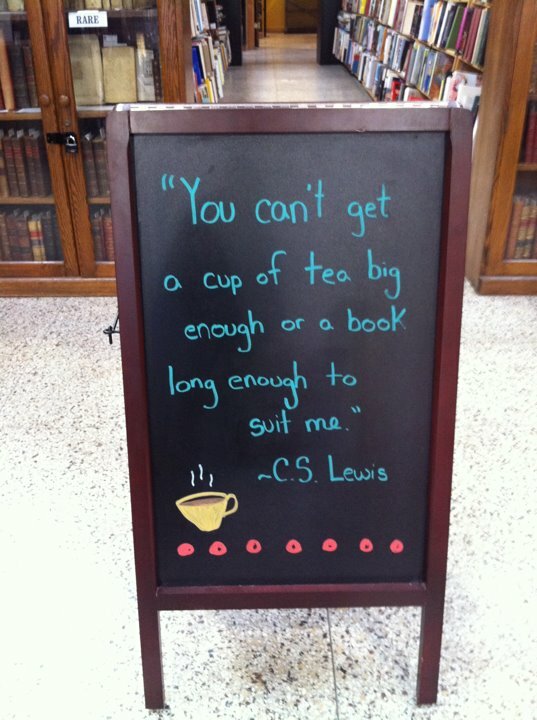 There are millions of books. It reminds me a lot of The Strand Bookstore in New York City, where there are millions of books in very tight spaces. You can't come in the store necessarily looking for a particular book. As much as I loveeee Barnes & Noble, that kind of task is for a store such as that. You have to come into this store with an open mind. You're looking for a book but not sure what kind of book, what you feel like reading, maybe not even what genre. There are four levels to browse and this is the only type of store where you can let yourself just be free, and wander. 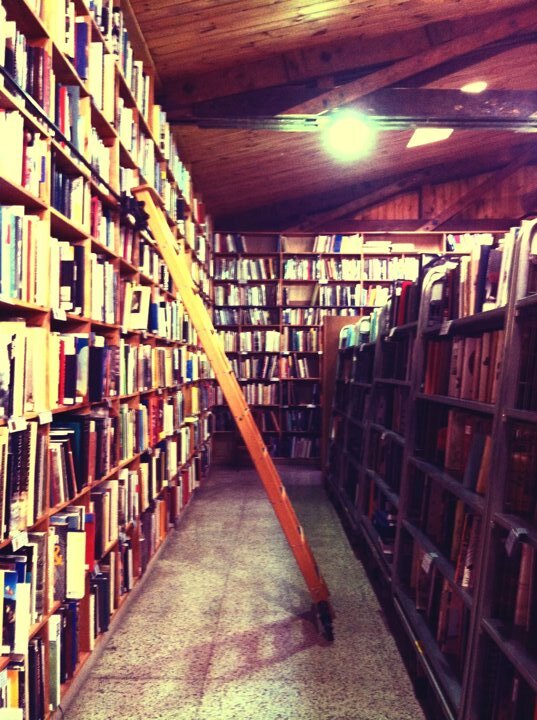 Wander until your heart desires to stop, and turn to your side and pick a random book off the shelf. The books are in all forms, from used books in the 1800s to modern day releases. They are not in any order, nor are they even stacked neatly, but isn't that what makes it enjoyable? It makes it random, as if when you stumble upon a random book you want, you can consider it fate, or a "good find". 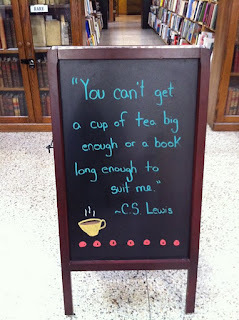 PLus, the books in general are a lot less expensive than normal, being that a lot of them are used. Also, they have an extensive and diverse collection of topics and genres to browse in, enough to keep you busy for at *least* two hours. It took us two hours just to walk up and down every aisle! Of course, that entailed continuously stopping to check out a new book you find, read a couple pages, etc. But still. Andddd, they have TEA. But not just tea, but like 5,000 different types of tea! It was overwhelmingly glorious and tasted way too yummy to have been made on this planet. 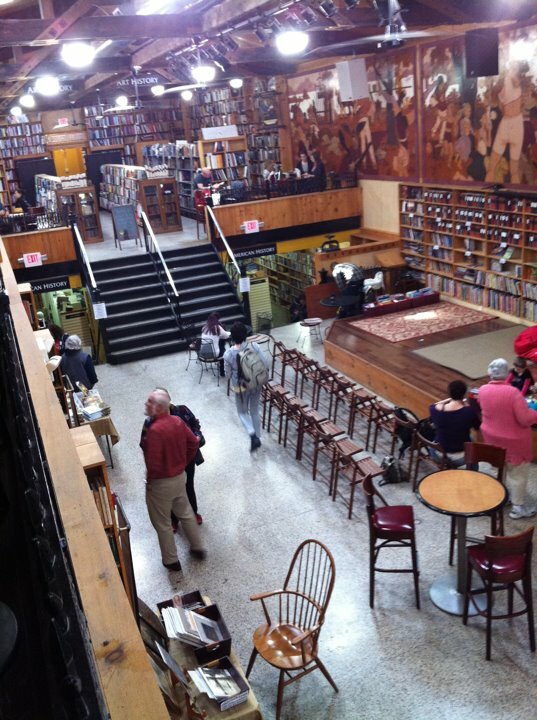 Being that its become to be a pretty well known bookstore, they have famous authors come in and speak/read. They have a specific section for readings and poetry readings. Even a little stage, mics, lights, etc. Throughout the upper level that overlooks the rest of Harrisburg, there are couches that they encourage you to stay awhile in and enjoy your book. Couches! And they have board games scattered about (scrabble, chess, checkers, monopoly, etc) that you can just start playing with at your pleasure. It just felt heavenly, unrealistic. Like I was wandering around aimlessly in my created heaven, just happy. No problems in the world, they left when I opened the door. It was definitely a very cool, worthwhile trip. If you live within the 2-3hour radius of Harrisburg, PA, I highly encourage you to make the day trip if you like bookstores, this one is worth it! This legit cannot describe me any more perfectly, that is a fact. They had LADDERS. Books to the CEILING! Like...BELLE! I just did three twelve hour shifts, and they each ended in their own way. The first, I felt overwhelmed. The first out of three is always a bit overwhelming because chances are you don't know any of your patients, because if you do 3 in a row, chances are you've had off for a couple days. So the first day is spent getting to know your patients, getting a hold on things, and making plans. Although 3 shifts in a row is exhausting, I really do love the continuity of care. I love being able to say at the end of my shift, "Sleep well tonight, see you in the morning! I'll be here when you wake up." My patients love when they know I will be back, I know them, they know me. They feel comfortable with that, with the same set of nurses taking care of them. Tonight, my third shift, I went and said my goodbyes to all my patients considering I have three days off. My one patient was sad to hear this and told me she had a question for me but couldn't remember what it was. I told her I would still be on shift for another 30 minutes if she remembered, but if not, the next nurse would be just as likely to know the answer as I would. And she said, "I know, but it's nice having you. You know when you just get comfortable with someone, and you don't want to give that up?" I said I understood and I was flattered but that the next nurse was very good and she would be in good hands. :-) So, continuity of care is excellent for the nurses and patients. The second shift, I almost cried by the end of shift. The day started out with an admission rolling up to the floor at 6:30 am. Being so late on the night shift, the night nurse was not realistically able to do any of the admission work. So in addition to seeing my 4 other patients at the start of shift, I somehow had to work in a 30 minute long (at least) admission assessment. So, thats just a sample of how the rest of the day went. Not well. I drove home last night pretty much as a zombie, staring at the road, flat affect. I was just done. LAst night I dreamt of IVs, doctors orders, patients coding, etc. Fun. However, my goal on each and every shift, before I leave my shift an before I come in to the next one, I make a goal. I think to myself, what went wrong today? How can I do my best to prevent that from happening again? Not everything can be prevented, but you can prepare better. What mistakes have I made today? How can I better that for the next shift? Each shift I make at least one goal to improve on for the next shift. I add something new to my "system" or pilot a new self-program until I find something that definitely works for me. That being so, today (my third) I came in with lots of new tips for myself, to prevent reoccurences from the past two shifts that I wanted to avoid. I came in ready for the day. I knew my patients well. I could predict what could go wrong, what would go right. I improved on skills I lacked the day before. Tonight I left work, for the first time, thinking "I actually don't hate my job today. I don't dread coming back! I can do this." It was a nice feeling, for the first time. The best feeling in the nursing world (well maybe not the best, but its pretty high up there) is seeing patients get better. For example, this one patient I had my first two shifts. On the first shift, I learned that he had a stroke a couple months ago, and has been suffering some deficits in daily living since then. I learned he runs his own business, and is normally a very independant elderly gentleman. However, when I had him, you would have never known. Suffering a severe hypoxic bout of pneumonia, he was very confused. He was a mess. He was not able to follow commands, he didn't know where he was, his speech was incoherent, he was trying to get out of bed, he was not compliant with keeping his oxygen on, and would not eat any of our food (or medication). So, he was a handful. The family kept telling me how this was so not normal for him, how normally he is so independant. I found it hard to visualize. The second day I noticed improvements. He would have bouts of time where he would occaisonally open his eyes and respond appropriately to a question. His o2 SATS were doing better and he was a little bit more compliant. I was so glad to see him get better. He is definitely not 100% yet, but now I can see part of who he was before his hospital stay. I can see the marked improvement in status over the three days. It felt so good to see. I had another patient yesterday (the 6 am admission) who I took care of all day with a kidney stone. He was in a lot of pain all day and therefore was pretty dopey on pain medication all day. His family commented that he never gets drunk, and this was how they imagined him to act if he ever did get drunk. But it was better that than in pain. He told me he was a lawyer and that this was his first hospital stay. Today, I had to give him up too in the trade off, but I went in to say hi before he was ready to go home, and he and his wife told me that they were astounded with the care they had received during their hospital stay. What really mattered was that the family had a lot of experience with hospitals with other older family members, and they had therefore been in and spent time in a lot of other surrounding community hospitals. And they thought ours was by far the best yet, in terms of the nursing staff and general care they received. I was astounded. Our hospital? This one? Our little NFP hospital? Really? It was really nice to hear. Thats why we do what we do. To make that difference right there. Sorry its been long periods in between updates. I like to wait until I have interesting updates rather than "today was a bad day. blahhh". unless you want to hear that. in which case I would make posts that say that, if you want. Up to you. "You're going to have an ICU transfer as a patient today. Patient is not here yet. You can practice accepting an ICU transfer. Also, a patient that will probably be a CAT call (rapid response team)." my response: "Wait...those are two separate patients?" my patient (the ICU transfer, actually) was originally sent down to the ICU due to extreme lethargy and not being arousable. However, his status improved greatly and was able to be sent back up to us a couple days later. Meanwhile, the ICU nurse told me he didn't get much sleep last night (big surprise for the ICU) and that he would probably be tired. So I had to play the fine line game of: Do I let my patient sleep today, or do I continuously awaken him to see if he's lethargic? And if he IS lethargic, is it because he's just really, really tired, or is it because something is wrong? It turned out that he had so much going on with his medical care today (IVs, lots of meds, assessments, etc. in addition to normal stuff -mealtimes, bathroom times, etc.-) that I ended up waking him up every hour practically anyway. Me: Mr. Patient? Mr. Patient? Me: HI mr. Patient. Sorry to have woken you. Your dinner is here for you. *I start getting tray prepared and he starts mumbling nonsensical words strung together. I am instantly concerned. Me: Mr.Patient? Can you repeat that? I can't hear you. Me: Mr. Patient- Can you tell me your name? Me: Okay, good. Can you tell me where you are? Me: Okay good. Can you tell me what day it is? Me: How about the month? Me: Mr. Patient, can you tell me who the president is? Me: Mr. Patient, can you tell me what year it is? Me: Okay good. And who is the president right now, in 2011? Me: Not quite....Can you describe him for me? Pt: Um...He's african american...young fellow. Eventually, after being awake for 5+ minutes, he started to go back to normal and was able to recall being confused but didnt know why. But, all turned out well. And Oswald is not the president. First of all, for an idea of what I will be talking about, Read This Post to catch up on things. If you recall in June 2011, I was uber excited for being picked to go to this Nursing Honor Society Convention, in October. It felt so far away then, being June. But now its here- And I am here! In Texas. And OH MY God! What an amazing, and most of all-strange- experience it has been thus far. I have met really important people and have had some great networking contacts. My ex-professor, and my travel partner on the trip and reason for being here in the first place, is somehow friends with every important person in this entire organization. I have lost count on how many CEO's, Deans of (good) schools, and Presidents I have met because of her. Not only met but they actually gave me business cards and if I apply to their school and email the deans directly, I will get in for my MSN or DNP or PhD.. Oh my god! This is absolutely insane. Absolutely. Goes to show how important it is to be overly polite, kind, interesting and interested....and how far it can get you. And to have a really strong hand shake, and to say the right things....yadayada. But so far the conference has been listen to important people speak during the day and write down notes, learn really important stuff, and then by night- regroup and "drink socially and eloquently" with the people you listened to all day. So being that my professor is in the circle of important people, by night I have somehow found myself drinking wine (way too much wine-this is troublesome) with some very important people. Crazy!! Also, I have met other nurse bloggers! Which is so cool. 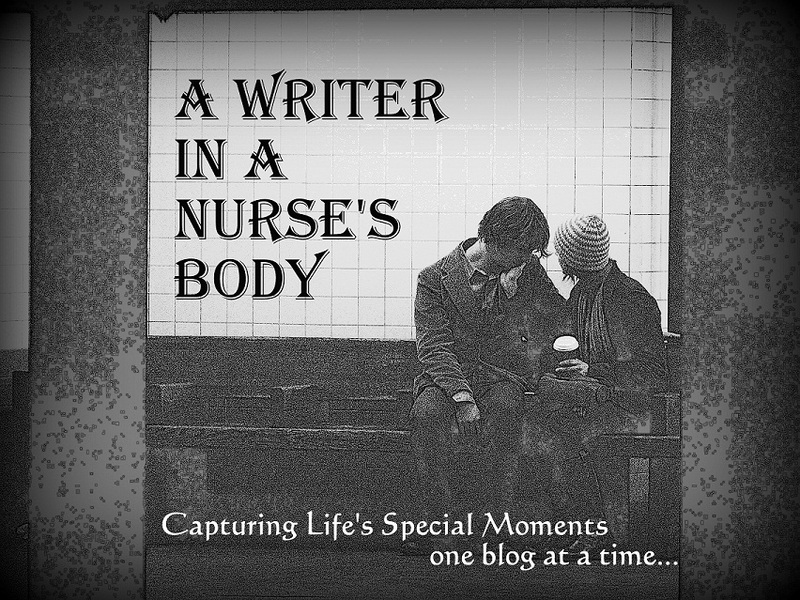 Apparantly nurse blogging is really picking up popularity among nurses in general but is also catching the attention of this organization. So I made extra sure to be wary of what they were saying on the nurse blogging frontier, to make sure I wasn't stepping in any muddy ground by having a blog about nursing. It seems to be the ongoing current question right now- is nurse blogging taboo, or is it the future? Should our workplaces know about our blogs, or is it OK to keep them private? Is it OK to tell them? What about our schools we graduated from? Can we openly talk about our schools of nursing? Where do you draw the line? What we narrowed it all down to was that "Nursing Informatics" was the core of all things nursing for me. Informatics can leave me openings not only for a long education, but to possibly delve into NASA, the Air Force, Politics, Humanitarian efforts, Emergency medicine, Epidemiology and Disaster relief. What it all comes down to, is that technology fits everywhere. Can I say it enough times that technology is the future? Of everything? "Nursing Informatics" and its a rapidly growing field. Its all about revolutionizing nursing through enhancing technology. And, I come from a family of technology and I consider myself to be pretty competent with technology, and I have a lot of strong ideas for technology and nursing in the future. At the beginning of the conference, I didn't know what nursing informatics was. But I had(have) at least three solid nursing inventions. By day 2, I discover this new field. It intrigued me, but it was so foreign and new to me that I really had to think it over and learn more about it before I went crazy over it. 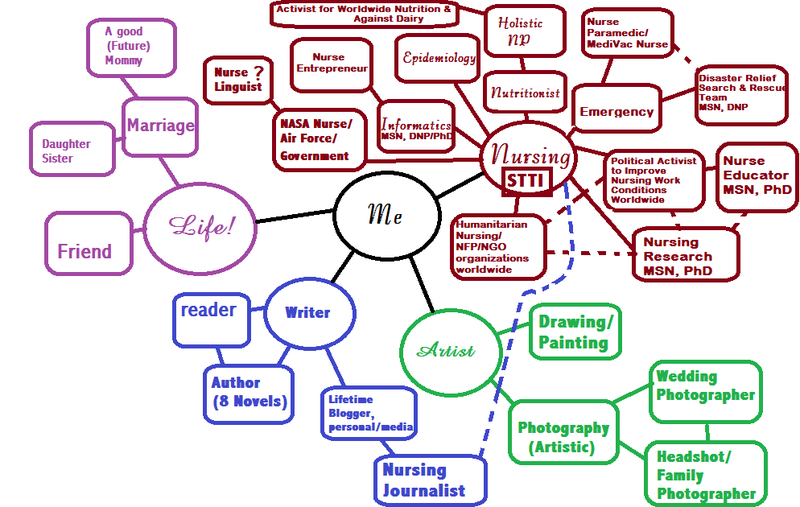 By 5, after listening to multiple "technology in nursing" seminars, I was crazy about it. I kept itching in my seat- I wanna learn! I want to do this! I can do this! I want to get in this field now- this is where we're all going! Not just nursing, but the entire planet! This is the answer. I wanted it. I do want it. Also, with one of the particular schools that want me, I can skip right over the MSN and go right for my PhD, which is, insane. I'm 23. Am I really ready to think about PhD? Granted, I signed my soul to a 2 year contract with my hospital now, so I can't officially start my PhD until I'm 25.....Ah. Could I actually be Dr. Somebody by the time I'm 30? Could I? 4) you're just really, really young. There was something really intriguing, however, that I noticed at this convention that has to do with the question: Who do I be, mom/wife, or powerful nurse? Well, at this convention I came across multiple women in very-high up positions. Granted, 95% of the organization has got to be women. Most of the government is made of women. And some of the men in the audience? They were there for the sole purpose of supporting their wives. They came to this conference of nursing to congratulate their wives who are probably making way more than them and just got an award for saving a bajillion people in Africa, or something. But seriously how sweet is that? How awesome is that? How new millenium is that? Awesome! This organization seems to be the one door to open that will open a thousand more doors, If I play my cards right. And by golly, I'm about to start learning how to play some cards! This organization not only can help me travel for fun and business, but for humanitarian/volunteer efforts. Like, safe children in Africa sorts of trips. I really doubt my life will ever have a dull, boring moment. If it does get boring, time to start the next big thing I want to do! Also, I am absolutely crazy.